Have you ever known exactly what you wanted for Christmas? As a child, you may have written a letter to Santa, made a wish upon a star, or locked your dream away in your heart afraid that it might not come true if you so much as whispered it out loud. Even as adults, Christmas wishes carry a magic that can't be explained. In North for Christmas, Ruby Jeavon certainly has her heart set on an engagement. It's the first step in creating the family she's always wanted. But things go slightly off course and instead of flying to Italy with her boyfriend, Ruby heads out of town to work as an elf in Nashville. Even though she's far away from her dream, she's about to discover the magic of a Nashville Christmas through the eyes of North Foxwell, her fellow elf and a Christmas expert. Even though North struggles with his own Christmas ghosts, Ruby manages to bring new light to his life. Can Ruby let go of her dream to find what her heart truly desires? Only time--at the North Pole--will tell. Ruby Jeavon takes a position as a Christmas elf in order to evaluate the Nashville North Pole Program from the inside. For years, the program has been losing money and investors want a reason to pull out. Ratting out a Santa isn't Ruby's style, but someone has to do it. She’s mortified by the striped tights and elf shoes, but she has a goal and nothing, not even the handsome Nashville native, North Foxwell, will stand in her way. North’s dad was diagnosed with cancer. The news brings North home to Nashville for the holidays where he’ll have to face his past, his grudge, and his bossy sister. North gets more than he bargained for when Ruby steps into Santa’s workshop. He’ll do everything he can to save the North Pole Program, but in the end, it’s North that needs saving – and Ruby’s just the girl to take on the task. “Are you Mr. Foxwell?” ”Yes, sir.” “I’m Mitch.” He tucked the clipboard back under his arm. “We’re waitin’ for one more passenger.” “Will it be long?” North’s stomach rumbled. “Her flight just landed, so it should only be a few minutes.” They made small talk as they watched the people gather around the baggage claim. “I’ll bet that’s her,” said Mitch. North followed his gaze. Walking toward them was none other than Ruby Jeavon in a pair of designer black boots, tight jeans, and an oversized, but somehow still flattering, sweater. She expertly maneuvered two large bags, a carry on, and her purse in their direction. Maybe it was Karma that brought her here. Or maybe it was an angel with an overactive funny bone. Either way, North was not at all surprised to see the one woman who could make his trip home more awkward. He’d gathered from Ruby’s inclusion in the charity review meeting that she was on some sort of training schedule with Kathleen, and being here was probably a step up the ladder for the spoiled daughter of a powerful executive. He still hadn’t figured out a way to explain his behavior yesterday. He hadn’t meant to embarrass Ruby more than she embarrassed herself, but his laughter in the elevator had done just that. She needn’t worry about him or Fredrick saying anything that would tarnish her reputation or the reputation of the company, but Ruby didn’t know him from Adam and had little reason to trust him at this time. Not only did North need Ruby as a future client, he couldn’t shake that moment when their eyes met over the conference table. He’d found himself thinking about it at random times throughout the day. He decided she may have a hard candy shell, but what he’d seen in those eyes was sweet and kind, even if he only caught a glimpse before she turned into Bumble the Abominable Snowwoman. He’d put it off sending an email or flowers or a bouquet of candy canes to smooth things over so that the next time they met they could both just ignore it and move on. Deciding that was the best course of action, he put a welcoming smile on his face and stepped forward. “Can I help you with your bags, Miss Jeavon?” Ruby blanched and an awkward silence formed between them faster than ice on a Memphis highway. “Miss Ruby Jeavon?” asked Mitch. Ruby ignored North. “Yes, that’s me.” “I’m with the North Pole Express Shuttle Service. Can I help you with those bags?” Ruby gave Mitch a genuine smile and allowed him to take the larger of the two bags and her carry-on. “Thank you.” She took quick, long strides to keep up with Mitch as he led them toward the waiting van. North, who was used to being the tallest in the group, had to stretch his legs to keep up. He found Ruby’s hurried pace comical. It reminded him of the way he could get under his sister’s skin without trying. Ruby glared over her shoulder. “Are you following me?” North laughed. “Technically, yes and no. I think we’re riding together, so I’m not following you just to follow you. But you’re walking in front of me, so I’m following you.” “Accountants,” Ruby muttered. She pulled up short and fixed him in place with a look that could make Jell-O hold still. “Wait, we’re riding together? As in, we’re going to the same place?” “I guess so,” he replied with a cautious note. She took off again, her shoes ticking against the concrete like a timer on a bomb. Tick. Tick. Tick. “What exactly are you doing here?” she threw the question over her shoulder. The airport doors slid open and an icy blast of air bit North’s cheeks. He braced himself for more than the cold weather as he contemplated his answer. His reasons were personal, and he had no intention of sharing them with a near stranger no matter how pretty she was with her cheeks pinked by the cold December air. Ruby shimmied into her coat and efficiently buttoned it up as she walked, never letting go of her roller. It was a feat worth admiring, and North found that he enjoyed admiring Ruby despite her obvious dislike for accountants. His constant awareness of her beauty surprised North. Ruby, and her international Christmas travels, were the exact opposite of what North valued in a woman. He wanted to share his life with someone who was as dedicated to sharing as he was. A woman who wanted a family, a home, perhaps a dog… Before he could come up with something to say, she demanded, “Did my mother send you?” “Did your mother send you?” North fired back. He groaned in frustration as Ruby whipped around and climbed into the waiting van without another word. He wasn’t doing a very good job of making amends. Feeling a little like a lump of coal, North settled into his seat in the van. 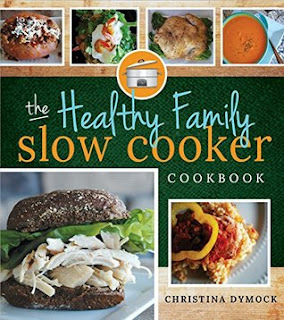 The Healthy Family Slow Cooker Cookbook Feed your family the foods they love—with a healthy twist. Everyone knows slow cookers are a busy mom’s best friend, but it can be a struggle to find healthy Crock Pot recipes your kids will actually eat. Not anymore. These delicious family-sized meals are perfect for parents and kids alike. Chicken and Artichoke Fettucini Teriyaki Pulled Pork Cajun Rice with Shrimp Butternut Squash Soup Chicken Quesadillas You’ll even find some tasty ideas for sugar-free desserts, like the Blueberry Pudding Cake. And every single recipe can be made in the morning and ready to eat by dinnertime. With a little prep and planning, you’ll soon be enjoying nutritious, healthy, home-cooked meals every night of the week! I really need to use my slow cooker more, especially now that we are in the hot summer months and turning on the oven seems like a crime :) I was super excited to read this book since a few months ago I started "eating clean" and I'm loving the benefits of a healthy diet. The author starts out with a few pages of the health benefits of slow cooking, slow cooker basics, and how to care for your slow cooker. The recipes are them divided up into six sections: Poultry, Pork, Beef, Soup & Salad, Sides, and Sweet Endings. The recipes are right up my alley- basic, easy, with no fussy ingredients (you know, those hard to find gourmet ingredients that I often have to look up on the internet just to figure out what they are...) There is a definite use of spices and seasonings which I appreciate since I'm not great at knowing which ones to use (or how much) so my food doesn't taste bland. Every single recipe in this book is one that I would feel comfortable making and feeding to my family. Not kidding. I've never experienced that before with a cookbook. I highly recommend it for individuals and families alike! My only complaint is the quality of the images. It's obvious that a professional food photographer was not used since the color, lighting, and sometimes even the focus was off. Of course, as a photographer that's just me being nit-picky. Don't let that prevent you from buying this book! Christina Dymock is a graduate of the University of Utah. She has had careers as an editor at an advertising agency, an adjunct instructor at Salt Lake Community College, and author. An avid cook, Christina divides her time between the kitchen, her computer, and books and her family of six. (Naturally, the family gets the biggest share.) Because she reads everything, she also feels compelled to write in several genres. Her latest book, Blue Christmas, reached the Amazon top seller list in 7 categories as part of the Christmas anthology, Christmas in Snow Valley. Christina attends multiple writer’s conferences each year, is a part of several critique groups, and enjoys learning about writing. She has been featured during the cooking segment of several local morning shows, published in Woman’s World Magazine and the Deseret News, quoted in Womans’ World Magazine and Parents’ Magazine, published in seven Chicken Soup books, and has published clean romantic fiction under the name Lucy McConnell.